Rosy peaches have been widely available at our local markets for the last few weeks and I can't help myself but to buy arm loads of these beautiful, blushed fruits. When I arrive home I frequently look at my overflowing bag and think, "Now just what am I going to do with a dozen peaches that will all ripen on the same day?" In addition to our luscious weekend treat, Peach Crepes, Ellie Krieger's Savory Peach Chicken was a perfect solution to our peach buying spree! Four perfectly ripe peaches were chopped into large pieces and sautéed with a savory mix of soy sauce, garlic, and orange juice for a perfect sweet/savory dish that was a family pleaser served over rice. A nice side salad along with a beautiful bowl of fresh berries (I was lucky to find organic black berries and golden raspberries!) completed our healthy weeknight dinner without much fuss and a request to "please make this again soon" was music to my ears! Spray large skillet with cooking spray and add onion wedges, cooking over medium heat for about 4 minutes, just until they begin to get tender. While the onions are cooking, combine the brown sugar, soy sauce, rice vinegar and orange juice in a small bowl, whisk and set aside. Add ginger and garlic to the skillet and cook for 30 seconds. Add the chicken broth, soy sauce mixture and peaches to the skillet and simmer, uncovered, for about 5 minutes or until the sauce thickens and the peaches begin to soften. Add the cooked, sliced or chunked chicken to the pan and cook until heated through. Serve over white or brown rice and top with a sprinkle of sliced scallions. Aw man I just made chicken pies with fillo dough, I wish I had seen this right away. Next time I am at a loss for ideas I'm going to ask you. This looks really good, especially with the chicken and peach combo! What a wonderful pairing of chicken and peaches, yum! I really like how that recipes sounds. Did you hear that? That's my stomach talking to ya! This looks absolutely amazing! The peaches has dried up around here, though. :( Next summer! 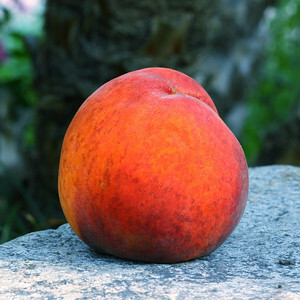 I'd give anything for one of the juicy sweet peaches we have in CA right now, here in Texas the produce isn't quite the same. I like the idea of them with the chicken. Have to try this when I get home. This looks amazing! peach sauce is appetizing. What a perfect meal for Fall! This is such a nice little twist on chicken breast. I definitely fall into a rut when it comes to boneless, skinless breasts. This one is a keeper! That is a great recipe. I can't wait to try it. I, too will have to wait for next year to make this with frssh peaches. However, in winter I make a similar stir fry with chicken pork, or shrimp using Trader Joe's Smokey Peach Salsa, which gives it a little "kick". Another great recipe Kim! My husband LOVES peaches, maybe I will surprise him with this, thanks for sharing! I am all about the sweet and savory, that being said, this is the perfect recipe for those flavor combinations! If only summer stuck around a little longer, I'd make this meal in a heartbeat. 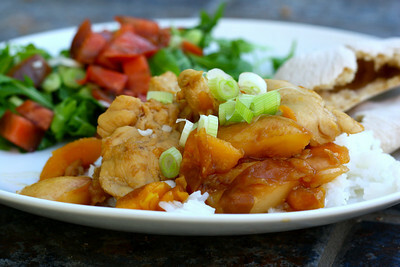 Great idea and combo - peach and chicken. Never thought of it before. Will give this a try. Thanks. Oh yes, that does look and sound delicious. I love the combination of savory and sweet. I adore peaches and chicken is the perfect go-to meat for this dish. Thank you for sharing! Canned peaches could be substituted when peaches are not in season.